Guys, have you tried cooking with gochujang yet? This bold, spicy, savory, slightly-sweet, and irresistibly-good Korean chile paste has become one of my favorite ingredients to cook with this past year. We use it regularly in our kitchen to whip up quick Korean stir-frys, liven up soups and salad dressings and marinades, and make the sauce for Barclay’s favorite spicy Korean noodles (<– recipe coming soon). Most often, though, I love using it to make a super-simple gochujang sauce for lettuce wraps! This 4-ingredient gochujang sauce only takes a minute or two to whip up with gochujang paste, soy sauce, maple syrup and sesame oil. And when tossed with a few crunchy veggies and your choice of protein (beef, chicken, pork, shrimp or tofu would all work here! ), you can have a batch of the tastiest Korean lettuce wraps ready to go in less than 30 minutes. It’s the perfect light meal or appetizer for springtime. It’s a great recipe for using up leftover veggies or protein in the fridge. And I’ll just tell you now — once you whip up a batch of this simple sesame gochujang sauce, you’re going to want to put it on everything. 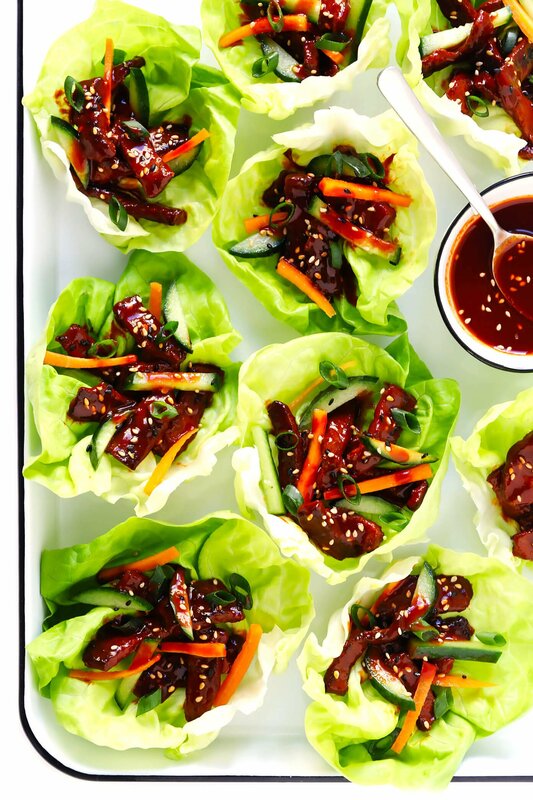 So add a bottle of gochujang to your grocery list, and let’s make some lettuce wraps!